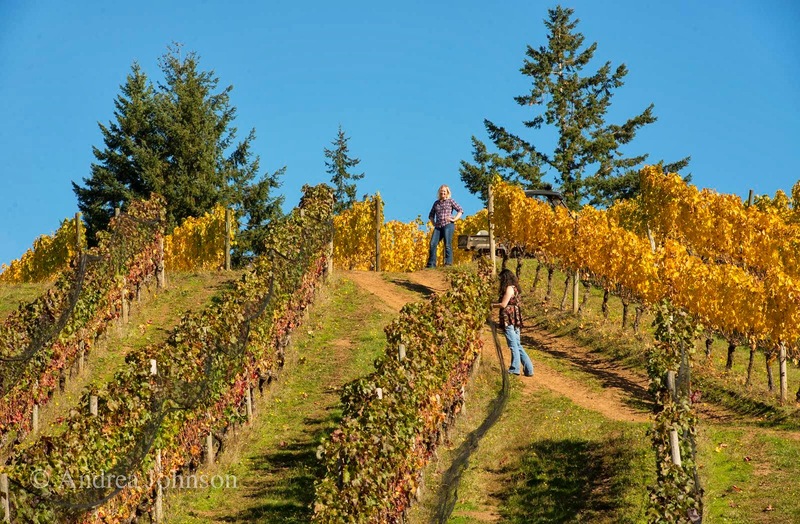 At Kramer Vineyards in Gaston, Oregon, young second-generation wine maker Kim Kramer is just beginning to get her bearings on the family's small estate. Her first vintage flying solo as the winemaker was 2010. At only twenty acres, it's not that Kim is in danger of getting lost, but the diversity of the family's site can certainly make it challenging as she tries to get a handle on what's happening in the vineyard. "We have a hilly site, with vines of different ages, clones, root stock, etc. This results in a surprising level of variability in terms of ripeness and varietal expression. It’s kind of amazing to me the differences that you can taste from block to block in the field, but it makes sense." One particular parcel of the family's vineyard is Cardiac Hill, a steep site, originally planted to Gewurztraminer back in the 1980s. "Cardiac Hill has earned that name for multiple reasons. While the hillside is indeed quite steep, it has challenged us in other ways that only contributes to the name." The vines never really took, the fruit set was never quite right and so they were ripped out and eventually replaced with Pinot Noir vines in 1995. The site, however, continued to give the Kramers heartburn (Ha, get it?). "It continued to under-perform for years, due to a combination of factors--poor fruit set, vine stress, and that the south end of the block is on a tree line, making it vulnerable to pest damage. The deer especially loved the new shoot growth in the spring, and it wasn't until we finished our deer fence in time for the 2005 vintage that we finally had a large enough yield to justify a single bottling from there. So yes, Cardiac Hill is named for the steepness of the hillside, but it’s also a nod to the stress experienced by the vines, and by us." The site developed, and its unique character has lent itself to a single vineyard bottling at Kramer Vineyards (about 100 cases per vintage). A vertical tasting of any single vineyard wine hopefully shows both a site's signature and vintage variation, which means the winemaker isn't overdoing anything. A formulaic wine means that too much manipulation has likely drowned out both the vineyard, and the vintage, and what's the point of that? A vertical (plus one) of the Cardiac Hill wines shows a range of vintage variation. The wines in the vertical included the very cool 2007 vintage on through 11, skipping 2008. Overall, these were cooler vintages, but the warm 2009 was also in the mix. There were some constants as well, including minerality over fruit and an overall elegance to the wines in terms of their structure and texture. 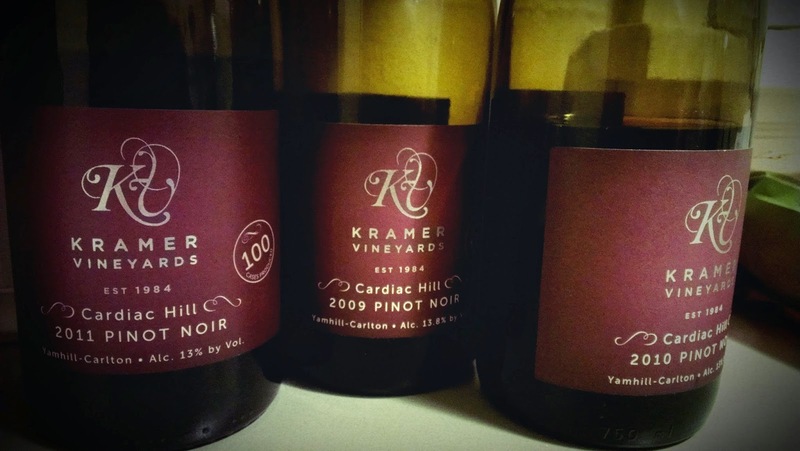 The site's signature is attributed to two factors by the folks at Kramer Vineyards: the soil of Cardiac Hill, which is dense and high in clay, and the fact that the block sits on a tree line, both of which create substantial stress for the vines. "Even without the soil maps, we figured out pretty quickly that this soil was very, very different from what was in the rest of the vineyard. One story that I hear over and over again is how difficult it was to pound the posts into Cardiac Hill—how it took forever, because the soil was so compact." The 2007 is lightly hued and began the tasting fairly muted aromatically. It is displayed very little in the way of fruit, instead exhibiting almost exclusively minerality. The wine was really gaining steam several hours after opening and on day two it had opened up aromatically, showing more bramble berries and spice. Kim was working harvest at St. Innocent in 2007 and so her first hand experience with the fruit then was somewhat limited. At Kramer they picked after the rains, "Those wines were shut down from release up until the last couple of years. They’re really only just beginning to open up, and that has been a beautiful thing to witness." The ripest of the wines in the vertical, with a fruit forward character to the wine while it retained an elegance and minerality. Full aromatics, with dusty blackberry and cloves, on the palate a candied cherry note and much fuller and round in mouth-feel than the other wines in the flight. The lone warm vintage from the vertical, the wine was showy without being over the top in terms of ripeness. Kim is happy with the wine but wonders if with a few different choices it may have turned out quite differently. "It was a model vintage, in that everything happened more or less on time, with good fruit set, and plenty of heat. Yet, I wonder what the wines would have been like if we would have harvested earlier. The fruit came in warm, so fermentation kicked off after just a couple of days. I’m trying to look at that as part of the vintage, but now I’d probably try to extend the cold soak. I also should have experimented with whole cluster fermentation, given the abundant crop. The wines, while quite approachable, lack the acidity and structure that is typical of our Pinots, yet entirely appropriate for the vintage. The silver lining here is that if we have another similar vintage, I know exactly what I’d like to do." My favorite of the bunch the 2010 is a very pretty bottle of Pinot Noir. Consistent with the vintage's reputation, the wine is approachable and elegant. Perhaps in contrast to the wonderful 07s, which really grew into their elegance, the 10s were that way almost from the jump. In the Cardiac bottling there's great aromatics; lots of dried violets, complex spicy aromatics and pretty notes of cola. The palate offers up round blue fruits and is really well balanced, the acidity is so pretty. For Kim 2010 was an important stage in her development as a winemaker. "In 2010, I worked harvest in Burgundy, for AF Gros/Parent. This was the most significant wine-making learning experience of my life. I learned both the how and the why of Pinot Noir production from a 13th generation producer. Furthermore, the harvest conditions in Burgundy that year were remarkably similar to ours here—cool, damp, and late. I came home, rested for a day or two, and we started picking. There was a great deal of trepidation that harvest, but I felt pretty confident given all I’d just learned, and was very clear on what we needed to do. 2010 is one of my favorite vintages for Willamette Valley Pinot Noir in the last decade. 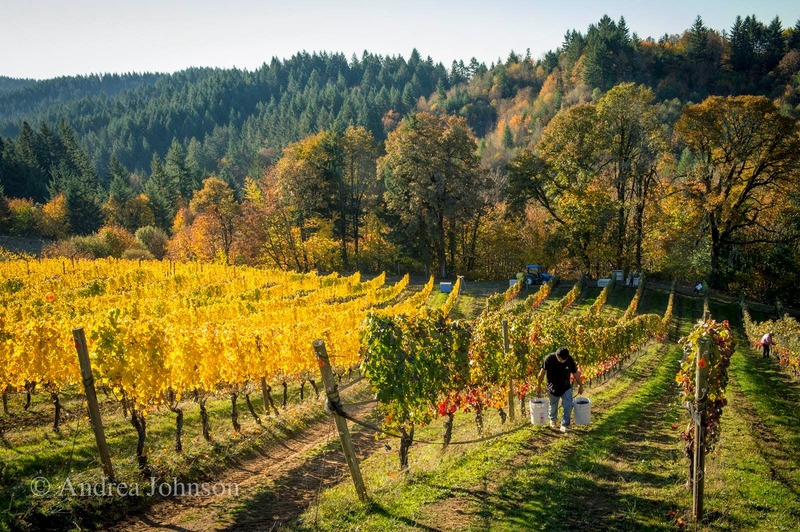 When I think about what Oregon Pinot Noir is, and I’m not sure I can articulate it clearly, but the balance, structure, acidity, and the unique Oregon-ness of the varietal expression, is all there." A story about potential, the 2011 is still a little tightly wound, and its acid is serious, real serious. Intense bright fruits, cranberry and red currant and a soaring acidity, I found the 11 to even be a bit astringent. I have little doubt though that it will likely become a pretty wine. For Kim it was a vintage that, while challenging, she felt equipped to deal with given how much she'd learned in 2010. "Our harvest was over a month late for the Pinot Noir, with very low sugars and high acids. We let the fruit hang as long as possible, but when the frosts started in early November, we were forced to pick. Then, we had the opposite problem from what we experienced in 2009, in that the cold soaks were long because it was so cold outside. I think this contributed to the beautiful color and nice primary fruit in the wines, and helped to keep fermentation temperatures low, limiting extraction of harsh tannin. I share your opinion that the ‘11s need time." Kim hoping to establish herself as "Queen of the (Cardiac) Hill"
As the vintages go by and Kim develops her voice as a winemaker, the individual blocks of her family's vineyard may provide a measuring stick for her to mark her progress. "I used to question the logic of a winery of our size producing four different Pinot Noirs, but after working a harvest in Burgundy in 2010, and seeing how small some of those appellations are, I was more determined than ever to continue the work my parents had started. Each block is harvested and made separately. This allows us to learn the nuances of each site from year to year from a production standpoint, and in the cellar. The fact that this is entirely site-driven, and not by our work in the cellar, is what makes it interesting and exciting for us." If these first few years are any indication, Kim is developing into one of the Willamette Valley's young talents to watch out for.